A high efficiency gas fire with clean landscape style design creating a simply stunning visual effect. Realistic dancing flames and logs that look amazing. This gas fire has not just been designed to offer good looks as at the heart of this fire like all of our high efficiency gas fires has been designed using our latest technology to offer lower running costs an amazing maximum heat output of 5.1kw and a mouth watering 83% efficiency rating, giving this fire the converted class 1 efficiency status. 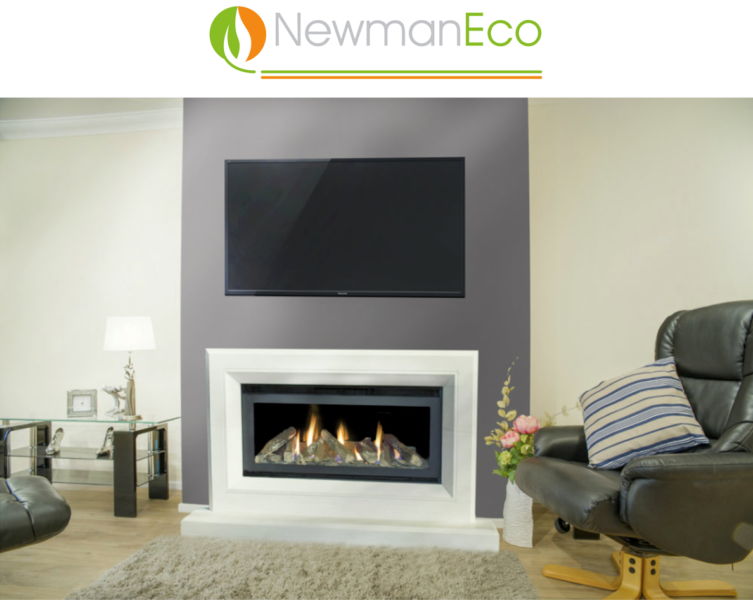 The Newmans high efficiency gas fires have hand held remote control with a choice of cream or black fire chambers, a reflective smoked glass chamber is available as an optional extra to enhance even further the fuel bed with leaping flames, simply magical. Optional non reflective facia glass available making the glass frontage nearly invisible. The Serenity natural stone fireplace suit has been designed specifically to accommodate the Newman Eco Panorama high efficiency fire, a fantastic floor mounted hole in the wall style fireplace with impressive bevelling and etching achieving a fireplace that really stands out from the pack when used in conjunction with the Newman Eco Panorama high efficiency gas fire.